John and Molly Chiles decided to build a new modern house in North Carolina, and they found just the place for it on the resurrected bones of an old modern house. 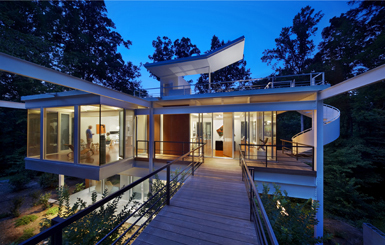 The Ohio couple explored the more traditional option of buying a home site and building from the ground up, but they soon became fascinated with the possibility of renovating an abandoned 1960s steel frame and wood panel house overlooking Crabtree Creek in Raleigh. Renovation does not sufficiently describe the task that lay ahead for the Chileses and Tonic Design/Construction, a local design-build firm. The house’s wood walls and floors had rotted, and it was camouflaged by a tangle of kudzu and ivy.